We were two families and the house was perfect size to share and never felt too cramped. Despite the heat the house wasn't too hot at night. The pool was a big hit with all in the heat, as was the outdoor dining table. We also had fun trying out the wood burning grill and pizza oven. Eugenio was very attentive and helped me out a lot when I had car problems. Dear Daniel thanks for your kind words. I am happy you had a great time at my property! The house is set in a beautiful position with great outside living facilities such as a shady verandah, brick build BBQ and wood-fired pizza oven. The view is entrancing and changes hour by hour so that watching it can become a major occupation (especially from the well-positioned hammock in the trees). Inside the house is cool and clean, decorated in traditional style but with thoughtful amenities such as books in a range of languages and lots of adapters. The kitchen is well-supplied with utensils and crockery and all the usual necessary gadgets. Eugenio was a very responsive and courteous host - even finding us the World Cup football games (England were playing) live stream website from Italian media. The bathrooms both needed a little attention when we arrived but again Eugenio and Ricardo were able to sort out the shower in one very quickly and would have sorted the shower door in the other if we hadn’t gone out just as the plumber arrived. A car is vital and the off-road access is a little nerve-wracking until you get used to it but we would absolutely go back again. There is so much to see and do when you can tear yourself away from the pool and the view. Many thanks, Eugenio - it is a lovely place and we had a great time. We were a gang of friends wanting a easy escape and this was perfect- the pictures do not do the place justice, it's much much better in real life! Will definitely be coming back next year! 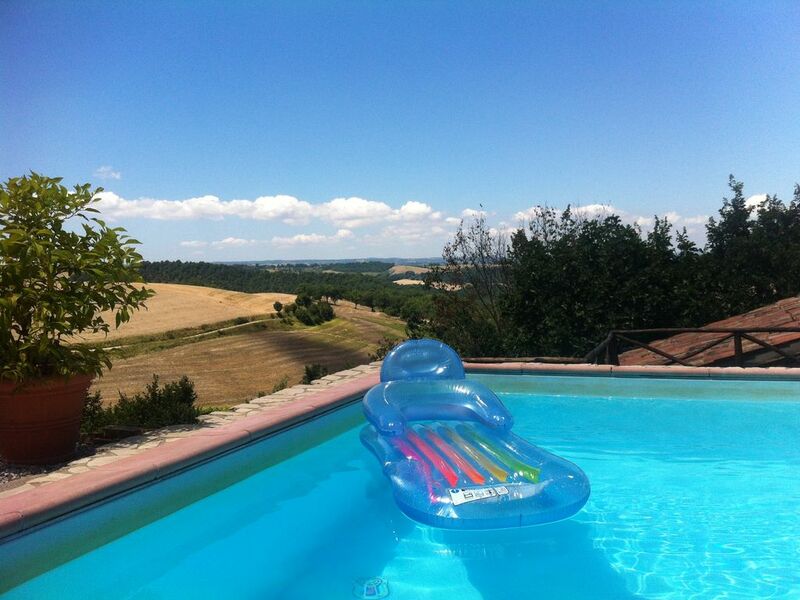 Isolated and peaceful villa with stunning views over the rolling Umbrian countryside. Property was perfect for kids of all ages with good sized bedrooms, a great family dining area and a brilliant cool pool. Also, for those that enjoy driving, an exciting dirt track to navigate prior to the villa entrance. Thoroughly recommended. The property is conveniently located halfway between Florence and Rome and has all the services and amenities you would expect from a holiday villa (including a traditional pizza oven which was a lot of fun). The villa is spacious and large enough so that you don't feel on top of each other. The beds are comfortable too which was of benefit as a number of our party have had back problems in the past (and all the bedrooms have fans too). For any large party or family looking for an Italian villa holiday we would definitely recommend this one. For those disinclined to cook we ate out a couple of times locally and the food was always good. Many thanks! It has been a pleasure having you all as our guests. Great place to stay with the family and really enjoyed the pool. Convenient location to visit Rome, Florence, and the awesome Orvieto! Definitely recommend. The house is at short distance from the artistic towns of Orvieto and Todi, close to Corbara Lake.